Were the LD-ROM² BIOS ever dumped into ROM images? An add-on for the TurboGrafx-16 console, the TurboGrafx-CD was the first-ever consumer device to use CD-ROMs as storage media for video games. 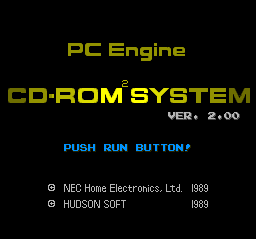 Released as the PC Engine CD-ROM² System in Japan (that's "cee dee rom rom" by the way, not "cee dee rom two" or "cee dee rom squared"), it was a success in its native country, where it got to the point that more PC Engine games ultimately ended up being released on CD-ROM than on the initial HuCard format. Unfortunately for NEC, this same level of success did not translate well in the U.S. due to the TurboGrafx-16 itself being a commercial failure in the states. There were four versions of the System Card BIOS, plus two regional variants for the U.S., with the fourth and final version adding support for Super CD-ROM² discs. Inside all of the system cards is the following message. 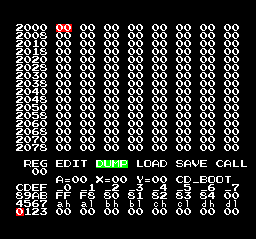 For example, it can be found at 0x3FAE0 in US System Card v. 2.0. This can also be seen in most, if not all, games for the TurboGrafx-CD. System Card Version 1.0 was included with the launch shipments of the CD-ROM² Interface Unit in 1988 (which did not include the actual CD drive, by the way; that had to be bought separately). Note the lack of a superscript 2 next to "CD-ROM" in the title, which was added in subsequent revisions. Exclusive to this version is a hidden debug mode, which is accessible by holding Up-Right + I + II on the controller and pressing Select. This debug screen allows user to modify save data stored inside the System Card's memory backup. This debugging mode would be disabled in subsequent revisions. 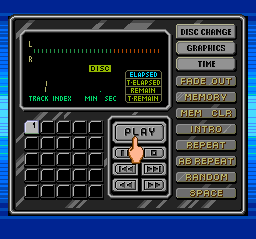 Version 2.0 was included in later shipments of the CD-ROM² System sometime in 1989 (around the time they started selling the Interface Unit and CD drive as a set). It served as the basis for the TurboGrafx-CD BIOS, which features a different title screen to go along with the different naming of the platform and its add-on in the U.S. Unlike HuCards, CD-ROM² discs are all region-free. Version 2.0 introduced support for CD+G discs, allowing users to turn their consoles into a karaoke machine. System Card Version 2.1, released in 1990 exclusively in Japan, was the first System Card that was sold as a stand-alone, intended to be a replacement for users who had their original System Cards lost or damaged. Its only new feature was its ability to auto-detect disc changes. The Version 3.0 BIOS was launched in Japan in 1991. 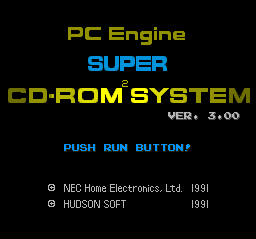 It was initially available built-in with the PC Engine Duo, a model of the console with an integrated CD drive, but was quickly offered as an upgrade to owners of the original CD-ROM² System in the form of the Super System Card, and later as an updated model of the add-on itself known as the Super CD-ROM² unit. The later models of the Duo (Duo-R and Duo-RX) also have this BIOS built-in. 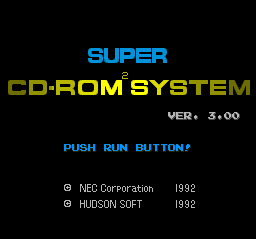 Version 3.0 increases the amount of buffer RAM from 64kB to 256kB, hence the addition of the word Super. Games that required this BIOS, which are labelled Super CD-ROM² discs, will display an incompatibility notice when loaded on a prior System Card. This BIOS was released in the U.S. 1992 and was similarly offered built-in with the Turbo Duo (the U.S. version of the PC Engine Duo) or as an upgrade for the TurboGrafx-16/CD in the form of the Super System Card (which was available primarily as a mail order). 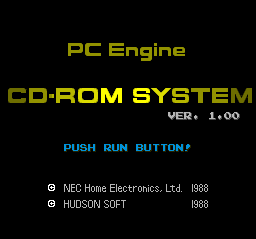 For the U.S. version of this BIOS, NEC went through the bare minimum effort of localizing it by simply removing the "PC Engine" from the title screen. 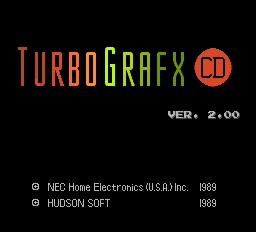 This was due to distribution of TurboGrafx-16 software and hardware shifting from NEC's U.S. subsidiary to Turbo Technologies Inc. (a joint venture between NEC and Hudson Soft), who opted to abandon the TurboGrafx-CD branding for the CD games in favor of keeping the CD-ROM² and Super CD-ROM² branding used in Japan. The Arcade Cards, released in 1994, were the final set of upgrades to the PC Engine CD-ROM² System and came in two variants. The Arcade Card Duo, designed for PC Engine consoles equipped with the Super CD-ROM², adds 16-Megabits of D-RAM on top of the 256kB of buffer RAM within the hardware. Unlike previous System Cards, the change was purely on a hardware level and there was no BIOS update this time, keeping it strictly on Version 3.0. People who were still using a PC Engine console with the original CD-ROM² System add-on could opt for the Arcade Card Pro instead, which essentially combines the functionalities of the Arcade Card Duo and the Super System Card into one by adding the 16-Megabits of D-RAM from the former on the top of the 192kB of added buffer RAM and BIOS update from the latter. Arcade CD-ROM² discs, which are games that require an Arcade Card, will display an incompatibility notice after loading if the hardware setup does not meet the requirements. The Arcade Cards were never released in U.S., as both the TurboGrafx-16 and Turbo Duo were already discontinued by 1994. However, a Japanese Arcade Card can be used on a U.S. console through a gray market converter or by installing a region mod into the console, allowing it to play Arcade CD-ROM² discs. As with the Japanese consoles, the Turbo Duo requires the Arcade Card Duo, while the TurboGrafx-16/CD combo requires the Arcade Card Pro. This page was last modified on 25 September 2017, at 11:30.